405,000 people, including 104 prelates — cardinals, archbishops and bishops — have so far signed the “Filial Petition” to His Holiness Pope Francis asking for “a word of clarification” as the “only way to overcome the growing confusion among the faithful” in matters of marriage and homosexual unions. For the signatories, an intervention by the supreme authority is needed in order to counter the creeping advance of the Cultural Revolution promoted by anti-Christian forces, which for decades have sought to undermine people’s moral convictions based on the Gospel and the Natural Law. According to the petitioners, facing the propaganda machine of neo-pagan customs, the Church always keeps alight the torch of sound doctrine and consistent discipline based on the Lord’s teachings. Paradoxically, this torch attracts more and more numerous young people from the most diverse social contexts, who are tired of the noxious consequences of the sexual revolution and wish to start authentic Christian families. For this very reason they are the first to expect a confirmation of Gospel morality from the supreme apostolic authority. However, the signatories say, at the Extraordinary Synod on the Family held in October 2014, the light of that torch, rather than being reinvigorated seemed to falter due to confused and dissonant opinions that emerged inside and outside the synod hall. These theses were immediately taken up and spread by the secularist propaganda machine. Aware that seemingly slight moral concessions can have disastrous consequences, in view of the Ordinary Synod on the Family to be held in October 2015 a group of lay faithful has promoted this “Filial Appeal” and created an association by the same name to spread it. 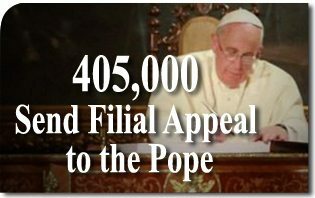 As the figures show, the initiative was quickly welcomed among the public and even among leading Catholic personalities in civil, academic and ecclesiastical life. The“Filial Appeal” Association also aims to spread worldwide the booklet titled Preferential Option for the Family, authored by three bishops, Most Rev. Aldo di Cillo Pagotto, Most Rev. Robert F. Vasa, and Most Rev. Athanasius Schneider. It is a user-friendly manual which, in one hundred questions and answers, succinctly but surely covers all the main issues at stake. This initiative has also found broad support among ecclesiastical and civil personalities. The work has been translated into several languages and has been distributed to all residential bishops around the world. Thousands have sent in requests for additional copies to be distributed among pastors, pastoral workers and faithful. This entry was posted in Catholic Perspective, Fighting the Culture War and tagged Catholic, Christian, Church, clarification, clarity, confusion, doctrine, faith, Family, Filial Appeal, homosexual, Law, marriage, moral, natural by The American TFP. Bookmark the permalink.